I just started listening to Sarah Mackenzie's podcast, Read-Aloud Revival. I love it! If you have been living under a rock, like I was, and are not familiar with the podcast, do yourself a favor and go and listen to it. The premise of the podcast is that you can connect with your kids by reading aloud to them. Anyway, I was listening to her podcast and she had Dr. Meg Meeker on as a guest (episode #102). It was a brilliant podcast and I've listened to it three times. That's big for me, I rarely reread anything or re-listen to anything. In the podcast she talks about what kids really need and it's not (a big shocker) more stuff, or put in more clubs or activities, they need you. That's it, it really is that simple. Your kids, my kids, they just need some quality time with mom and/or dad. Anyway, why does it matter if you and your kids have a good connection? First of all, let's establish that connection is just something in your mind. Don't believe me? Think of someone you have never met, like a celebrity, but you just love them. How can you love someone that you've never met? It's because feeling connected to someone is just a thought in your own head. So, you can decide that you have a connection with your kids even if they don't feel the same way back. So back to my original question, why bother having a good connection with your kids? There are many reasons but some of my favorites are: it makes a much happier home, which is something I am always working towards, and it also benefits your kids for their whole lives. Kids who have positive relationships with their parents have better health as adults. Also, it has a positive impact on kid's physical, mental, and emotional well-being. Now this isn't going to work if you're angry, being mean, or yelling. It's difficult to connect to someone who isn't nice. So, do your best to show up as your best self, but also be understanding that you too have bad days. When you are making sure that on your good days you are trying to connect with your kids, they're a lot more understanding if you need some alone time. Within the last two weeks I've canned green beans and grape juice. 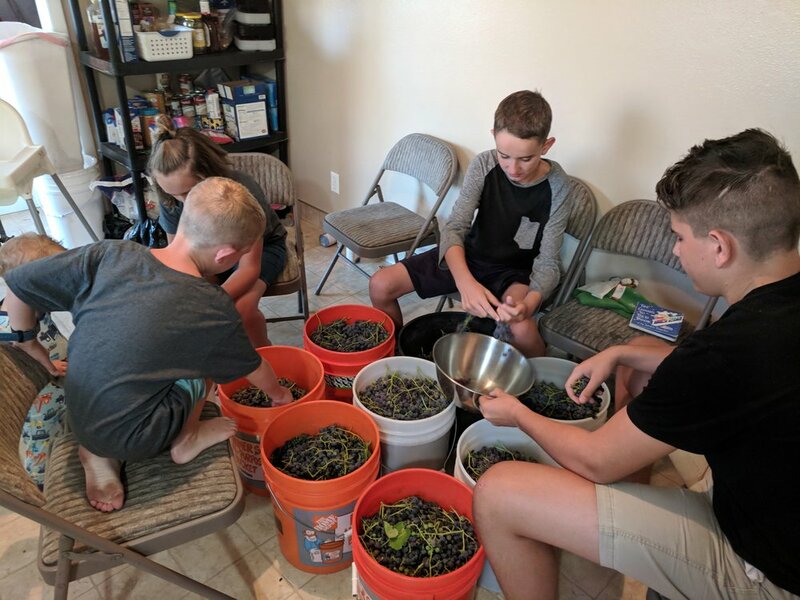 One of my monkeys helped me pick the beans and then all the kids helped snap the beans and helped with the grape juice. 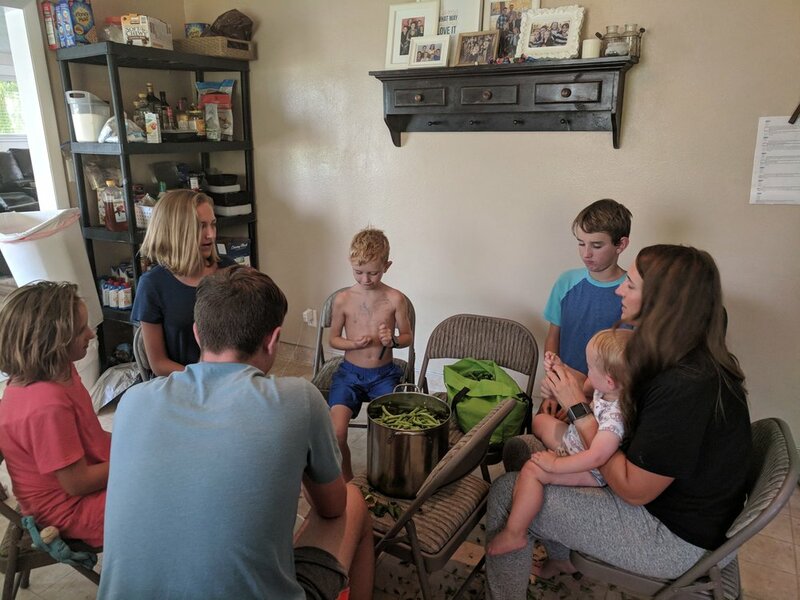 It wasn't necessarily the funnest activity, but we had a good time doing it; even though people were throwing beans and attempting to make outfits with the grapes. Bless their weird hearts. It doesn't always matter what you're doing to spend quality time with your kids; it just matters that you are.